If you follow me on Instagram, you’ll probably already know that for the past 3 months or so I’ve been doing Joe Wicks’ 90 day Shift, Shape and Sustain. First thing’s first, I want to put it out there that I didn’t technically do the 90 day SSS plan as I didn’t purchase it online. Instead I bought the three books – Shift, Shape and Sustain, and used each book in order for 30 days, using the workouts and meal structures in each. As is explained in the books, the layout is very similar to the paid plan, but is of course not tailored to you individually. Last Saturday I officially finished my 90 days and am so proud; this is the first fitness plan I have ever managed to stick out! Now I’ve experienced it for myself, I wanted to go through a few different aspects and tell you what I thought, as well as show you my own results. First of all, the best thing about this plan is by far the recipes. There really is something for everyone, and so many of them feel seriously naughty to eat when you’re trying to get healthier. This plan will really make you re-evaluate everything you thought you knew about healthy eating. Nothing is ‘off limits’ and all your favourites will be there; a good variety of homemade burgers, (yes, with white bread buns! ), bagels, pasta and loads of gorgeous creamy and cheesy recipes for when you’re after a low-carb meal. SSS is not only about what you eat but when you eat it. For the first couple of months I really loved this approach, as it allowed for some really amazing high-carb meals. Partway through the last month, however, my body decided that eating a lot of fatty foods all in one day wasn’t right for me, and I started to feel a bit of nausea. This is why towards the end of the plan and upon finishing, I have started to introduce healthy portions of carbs back into my meals. Don’t get me wrong, the nutrient cycling approach got me the results, however I don’t think it’s sustainable for me in the long run. Regardless, the meal structure in the plan taught me some valuable lessons about all the different food groups and their purposes, and I’m so glad I gave it a go! There’s no getting around the fact that as you progress through the 3 books, the workouts get HARD. The type of training in the 3rd book – Sustain – really pushed me to limits I had no idea I was capable of, but that is what made it feel so amazing. The mixture of HIIT and weight training right from the outset is a great combination, and the exercises in the first book are not at all intimidating, even if you’re a beginner. The workouts throughout allow you to go at your own pace, whilst also pushing yourself. Before I started the plan I was getting a bit bored of my usual workout routines, which involved doing a lot of different weight training exercises for short amounts of time, but the workouts I’ve been doing for the past 3 months have really changed my outlook on the best way to train for me. As a young person, affordability was a big concern for me at the beginning, but honestly, once you get used to the meal structure this plan is totally affordable. As with any venture to change your eating habits, there may be a bit of a splurge at the start whilst you’re getting in your store cupboard staples such as different cooking oils. The key as far as affordability is to plan your meals – I did this every Sunday, and continue to do so. Luckily for me this is something I already did before starting the plan, so it came quite naturally. It can take a bit of getting used to, but once you’re in the habit it will change your life whilst also making it a lot cheaper. By planning you meals you can use ingredients more than once instead of using a bit then throwing it away, and you also only buy what you know you will use. I would say that on average I have been spending around £35 a week on food, which I don’t think is too bad! When I also factor in the money I’ve saved on alcohol and takeaways it definitely evens out. I first of all want to point out again that I did not use the bought plan, so please don’t use my results as a guide for that. Regardless, I’m super happy with the results I’ve achieved! Over the course of the 90 days, I have lost a total of 8 inches from various areas, and toned up quite a bit. Considering I did the plan on my own and admittedly wasn’t 100% committed all of the time (life is for living – not sorry), I am so pleased with the outcome, and especially that I actually managed to stick with it for the first time ever! I think that fact alone says a lot about this plan, and how doable, realistic and actually enjoyable it is! I think what I love most about it is that the whole thing comes from a place of positivity, education and making you feel your best, rather than ‘eat this, burn X calories and lose weight’ which is incredibly refreshing. The funny thing is, I have completely changed my lifestyle, built muscle, lost inches and guess what? I weigh pretty much the same! Weight is only one indicator of health, and leaving behind the scales has been the most liberating decision of my life. *It’s really important that I mention that right from the start, I said to myself that I wanted my before and after pictures to be true and realistic. 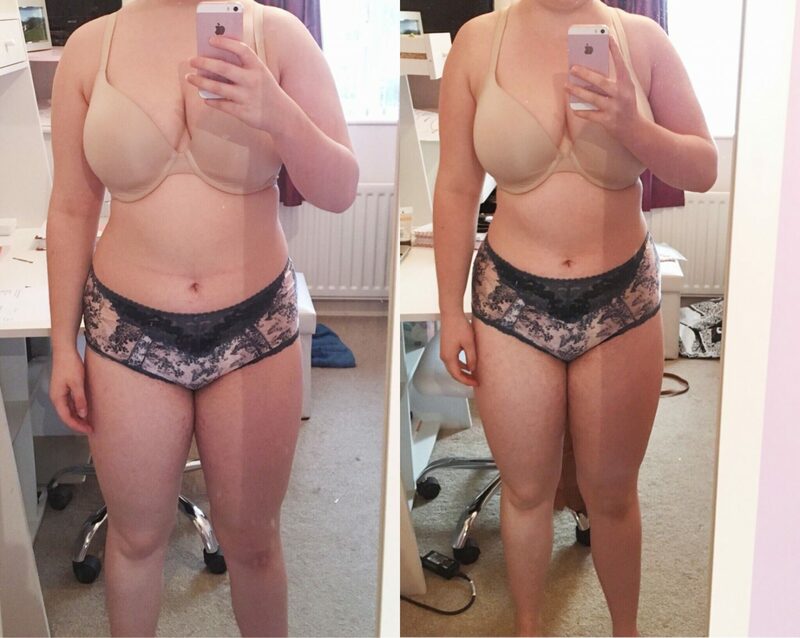 So I can vouch for the fact that I am stood in the same pose, am (obviously) wearing the same clothing (much love to my comfy granny bra), and was stood naturally without breathing in or tensing in both pictures, so the results you see here are all a result of the plan rather than any strategic methods of picture taking!